DECA Queen's is committed to maximizing value for every Corporate Partner. Below are our three most popular sponsorship opportunities. Feel free to browse our sponsorship package where we have several unique opportunities designed to fit the needs of every company or reach out to our Sponsorship Team. The title Diamond Partner of DECA Queen’s will be receive several valuable opportunities to establish strong, personal relationships between your firm and our delegates. This sponsorship opportunity includes many features including logo placement and branding in all promotional materials, the ability to sponsor a case category of choice and meal, 10-minute address at the opening ceremony or a dinner keynote, and custom Snapchat geofilter. Our sponsorship coordinators ensure we will exceed your expectations. As one of the case partners, your firm will have the unique opportunity to interact with delegates interested in your specific industry. Our experienced team will tailor the case study to your company. Your firm is invited to send representatives to 1-on-1 judge your case category, and network with all students throughout the day. 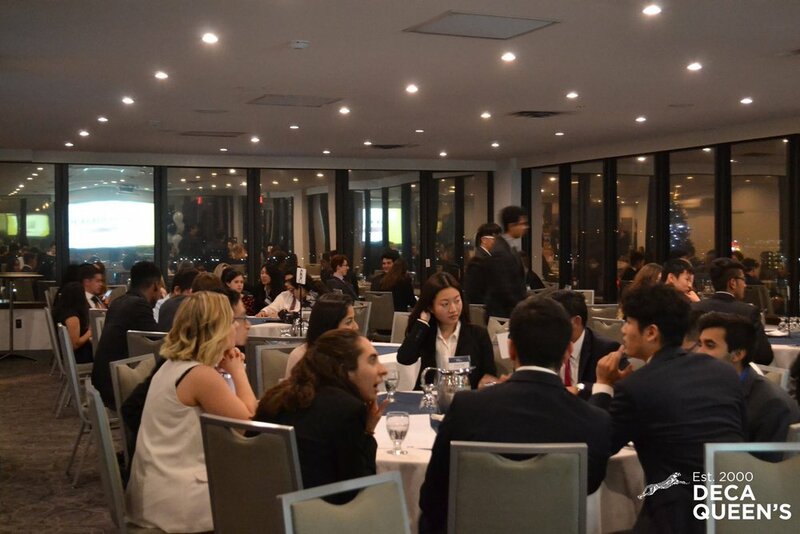 As the dinner partner, your firm will have the opportunity to personally interact with our delegates throughout our formal dinner on Saturday night. Some of the features included in this option are: the opportunity to send multiple representatives, branded dinner tables, 10-minute introduction before the meal and provision of the delegate resume book. Diamond Partners also may present a keynote speaker (vetted by the team).